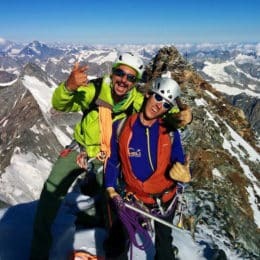 One of the IFMGA certified mountain guides of the Guide Monterosa team will take you to Monte Rosa, one of the most spectacular and varied heliski area of the Alps. Enjoy 2 heli drops and amazing descents during an unforgettable weekend. 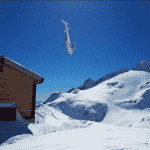 We are happy to invite you to a heliskiing weekend on the sunny side of the Monte Rosa. During this weekend, we’ll overfly and ski in an amazing area which extends from the Matterhorn to the southeast side of Monte Rosa. This stunning region has more than 20 landing sites, around 60 ski runs and a unique alpine scenery. In Monte Rosa everyone finds the perfect terrain and lives a different experience every new day. From December to mid-March you can find here the best powder snow conditions. Ideally, each guide leads a group of no more than 4 guests. That allows us to offer a maximum of flexibility since every minute of your experience is vital to us. All participants must be safe off-piste skiers in all snow conditions. It’s also mandatory to be fit enough to face pistes up to 6,000 vertical meters each day. As for the hotel accommodation, we can suggest 3 comfortable and warm hotels: the Dufour, the Nordend or the Gletscher. The 3-star Dufour Hotel is close to the ski lifts of Gressoney (Punta Jolanda) and offers luxury rooms, suites and a spa area. All the rooms have TV, telephone, bathroom and some of them a private Jacuzzi. The hotel’s restaurant serves excellent Italian cuisine. The 3-star Nordend Hotel is located in Staffal (a 5-minute walk from the ski lifts). It also has a spa area and modern rooms with TV, telephone and bathroom. The nearby restaurant da Giovanni serves excellent Italian meals. Finally, the 3-star Gletscher Hotel is near the cable cars as well. It has 12 nice double rooms with private bathroom and TV. There is a spa, with a Turkish bath, a Finnish sauna and a Kneipp bath. The breakfast buffet provides the necessary energy for the skiing days. 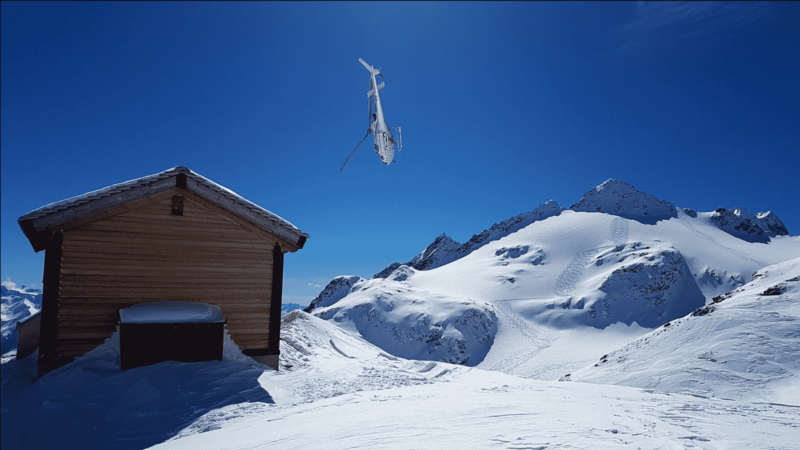 You can not miss the opportunity to fly by helicopter and ski in this incredible region of the Alps. Please contact me if you would like to reserve your place for next winter! Getting to Gressoney and meeting at 5.30 PM in the hotel. Welcome meeting with the guide, preview of the program for the next days, material check and afterwards dinner. Every day will depend on snow, weather and avalanche conditions. In case of bad weather we will go off-piste skiing. After the last skiing day, we will return the rented equipment and travel back home. In Hotel Dufour, Hotel Nordend or Hotel de Gletscher. - The price also includes: flight taxes for the included flights, ABS backpack, avalanche transceiver, probe and shuffle for the week and special renting prices for ski and snowboard. Euro 105,00 - 200,00 per person and flight depending on the landing place (The fight prices are depending also on the group size). The vertical drop depending on the landing place varied between 1000vm and 2300vm. - We always recommend trip cancellation insurance, baggage insurance as well as travel and accident insurance. - In the case of wind, bad weather or avalanche risk we'll refund €120,00 per flight and per person. No refund will be done, in case of illness, accident, deficiency of physical shape – lack of condition, bad skiing level, late arrival and breaks during the skiing days. A team of 12 IFMGA/UIAGM mountain guides from the Aosta Valley. 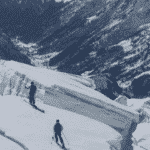 Guide Monte Rosa was founded after a strong snowfall in winter 1996. The Monte Rosa, while it is probably one of the most charming places in the Alps, is our base. The area offers unforgettable experience - the spectacular and in the same time fascinating landscape of the Monte Rosa is part of our freeride and heliski program. Why with our team ? Our team has now been operating in this area for more than 18 years. Thanks to our know how and knowledge of our area, we can guarantee a perfect process and offering a maximum of flexibility and individuality. Our highly experienced IFMGA guides will select the best descents according to the snow conditions and your ski level. Putting safety first, their goal is to help you fulfil your dreams and expectations. We would be delighted to share our passion for our work and region with you! Have a look to what we do with our friends and clients and get in touch with us to discuss about it. It will be our pleasure to guide you here ! We had two good days with very good skiing and we were also very happy with both guides. of nowhere. Organisation was impeccable, with Ode taking care of us right from the beginning. We did not wait at all and helicopter picked us up immediately for the first ride. Alessandro the pilot was super kind and helpful. We did two drops on two neighboring glaciers, 5 minutes helicopter ride. Only thing is that the downhill could have been longer, but that is due to the fact that wind conditions were extreme and hence only limited choice of dropping areas. I highly recommend this trip! too and the pilot (Alessandro) was super fast. Thank you for a great heliski day! !